Been slowly transitioning into learning more FX stuff at work since we have no dedicated FX artist. This is going to be a journal of stylised FX stuff that I’m learning. Here’s some of the stuff I’ve dabbled with so far. I really love your FX concept work. You’re shapes are really nice. Did you create effects based off of them? Looking forward to seeing more of your work! 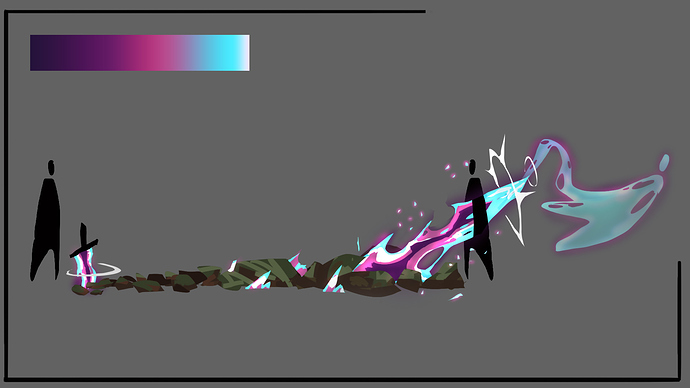 I’d love to see those daggers swinging around with some trails or particles following them. 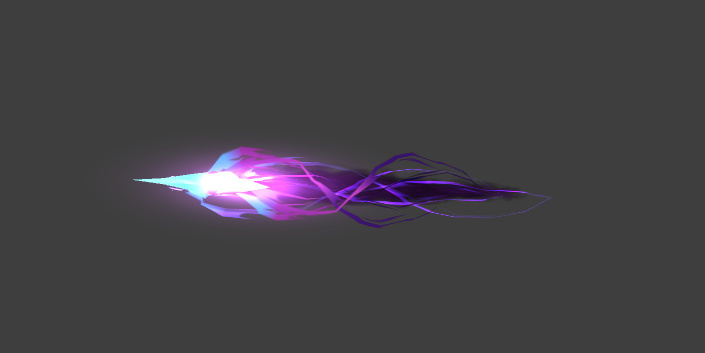 The fire dagger’s texture is just a little too noisy. You have a really nice art style going with the ice and magic dagger, but you lose that feel with the fire. Try a variation of the fire that’s more blocked out and smooth, like applying Median to the texture in Photoshop. The colors and embers will still help it read as fire even if it’s more like the two beside it. Your daggers are probably my favorite, the one of the far right I believe is the most successful. The color variation you have going on from the purples to the blues. I think you can push the color ranges a bit more on your VFX (a nice HOT yellow-white on that fire all the way to a nice red-purple as it fades for ex.). It also has a great, broken up shape which makes it feel more unique of the three. On the lazer beam, I feel like I’m missing a focal point. My eye is drawn to the impact where it hits the guy, but then it’s drawn back to the lazer. Really going in there and exaggerating the impact to be more intense (Possibly a very hot glow coming off the dude! ), or bringing up the contrast in the center of that lazer to make it feel hotter. You definitely show some good potential! Keep it up! @NateLane No I haven’t unfortunately. Still finding my feet with more complex effects so will get around to them when I am able to. quick concept idea for my next experiment. So it’s been about week and I probably overscoped on my concept since I’ve never done anything as complex as this before by myself. Main Issue I had was struggling to translate 2D into 3D. Some of the meshes looked good/strong sillhoute or shapes at one angle but then was horrible from another. Originally started fleshing it out with just a whole bunch of planes with shapes like this but they looked really silly from front on and etc so I ditched it. 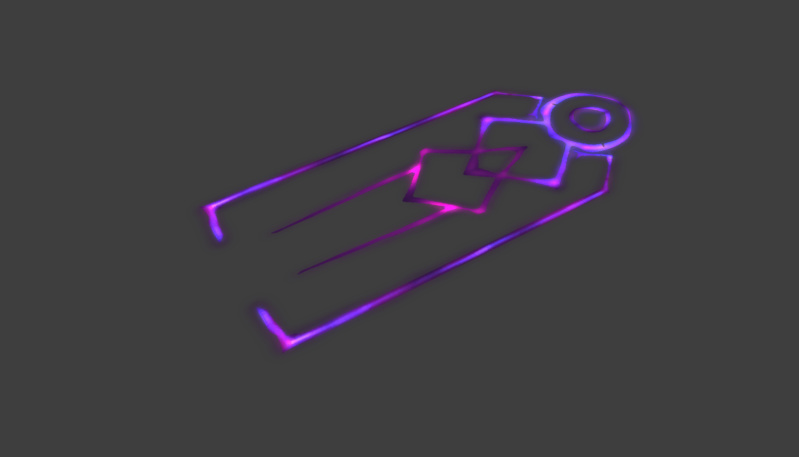 Also created like a decal UI to indicate the area of the spell but it clashed too much with the actual spell effect so I ended up removing it. I’m probably gonna take a step back and do some studies or do more practise translating 2D FX into 3D for next week instead. Please feel free to comment/advice/tips if you have any useful resources. It’d be great help. Thanks in advance! What I can say is that you’re off to a very good start, and the major question here is how to take your awesome 2D experience and translate it into believable 3D elements. One thing I’ve found helpful is going back to the roots of how elements work in real life. For instance, fire always has a fuel source. So as I’m building a flame, yes I put a couple of emitters to build the burning plasma, but I also need to make sure there’s a bright hot point at the core of the flame, or the fuel source. Also, fire emits smoke, so some subtle smoke puffs would also be helpful. Your “rainbow” element sword struggles the most of those 3 with having a defined cause/effect between its emitters. Currently, it betrays itself as a particle system, and fails to sell itself as a believable magical reaction. If you look at this Lux laser breakdown, you’ll notice how I used multiple emitters to represent different things: some are lens flare effects, some are glowing fuel sources, some are discharged energy bits, and some are the burning plasma coursing through the body of the effect, burning off of the intense fuel source at the core. The tricky part is finding a balance between enough emitters to portray each component of the effect, but make them work together in harmony to make it overall believable. To do this, I find it helpful to put each emitter into a bucket: primary, secondary, and tertiary. Primary elements are the hottest, most intense, and most important for gameplay. Typically, they are closest to white, or the most saturated, or the most opaque. Seconary elements are the theming of the effect. Think flame shapes vs splatter shapes. They should generally be less saturated, less opaque, and lower value contrast. Tertiary effects are the flavor of the effect. These should be so subtle that the viewer misses them on the first or second watch. Rays of light, subtle fuzz ball glows around the outline, dust, and tiny sparks would be examples of tertiary elements. We’re talking 10% opacity or so here. Very subtle, like a dash of salt to give flavor to the effect. Your work is looking fantastic. You’re well on your way, given the time you’ve put into developing your 2D skills. Moving to 3D engages a different part of your brain as you learn the tools, but never lose sight of the artistic direction you’re currently demonstrating in your 2D work. Been a while since I last posted. Here’s a WIP of what I’m working on right now. I suggest you play around with speed and color a bit. Motion is very linear all around, for example maybe you can compress the UVs of the smoke going down the cauldron so it moves faster at the top, slower at the bottom. Same thing maybe for the green line-swirls. I would even tint them as they move away. Good Job! But, what’s about try to add some color change, in the end of the effect the circle looks simple. Keep on! Finally had some free time to start working on some personal stuff. Something I’m working on right now.